Roger Haynes was born in Buffalo, New York June 3, 1947. He attended school in Hamburg, New York where he lived until 1966. Wanting a good technical education Roger joined the U.S. Air Force. After four years of active duty he moved to North Carolina to escape the cold, pursue his first wife and old cars, not necessarily in that order. He opened his own shop to service the needs of antique car lovers in 1974. Roger soon became a license plate collector. He did sandblasting for a living and soon learned how to refinish plates. ALPCA has always been about the friends you meet and the relationships that endure. Roger without a doubt has been a great friend to hundreds if not thousands of plate collectors in his 35 plus years as a club member. Roger paid his dues. He joined ALPCA in 1975 and attended his first convention in 1979. He spent fourteen years as a member of the board of directors. He spent seventeen years as complaint chairman. He co-hosted the National convention in Concord, North Carolina in 1981 with Ted Cline. At that convention sample and donation plates solicited from various DMVs around the country were first sold at the auction. That was Roger's brainchild which has caught on at every convention since. Roger was chief of security for the 2002 convention. In 1984 he helped form the Carolina Collectors Club, an ALPCA region. He has served as President, Vice President and Editor of the Carolina Club. A frequent vendor at Hershey, Roger has left his mark at car shows, flea markets and wherever license plate collectors hang out. He created the trade magazine Tags'n'Stuff in 1981 as an additional source for collectors to buy, sell and swap plates. Initially criticized, Tags'n'Stuff was widely copied and proved to be an effective fill-in for those months ALPCA did not publish a newsletter. It was not only about license plates but focused also on all types of transportation and military collectibles. It also introduced hundreds of new collectors to the club and the hobby. Hall of Fame member Gary Brent Kincade once said after four years of Tags'n'Stuff that Roger attracted more new members to ALPCA than anyone who had come before. The magazine had a long run but the onset of the internet goliath eBay and Roger's health problems brought it to a close. There have been followers but Tags'n'Stuff was "the" original and it is missed. Roger is also a great story teller, an art form that is fading from American society. His magazine featured guest experts from varying fields like Keith Marvin who volunteered their time and knowledge. Getting people to volunteer is the mark of genius and Roger is one even though he will never admit to it. His magazine covers are collectibles featuring the unique, the gorgeous and the bizarre and often unpredictable but never dull. Roger has never shied away from controversy as too many wanna be collectors have. He tells it like it is. He has mentored hundreds of collectors. Buy a tag from Roger and you will often find extras thrown in. Tell him about a needy cause and Roger is there on the front lines ready to help and lead. 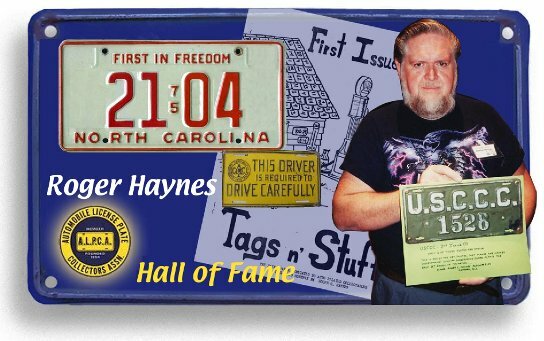 The decades of unselfish contributions to the hobby of plate collecting has earned Roger our respect and his rightful seat in the ALPCA Hall of Fame.